Herndon, VA – May 4, 2017 Joseph Dadzie came to America 30 years ago from his native country, Ghana, hoping for a better life, but was totally unaware that after having two children with his wife, Georgina, that their son, Kwesi, as well as the daughter, Araba, would be the reason their family would be realizing the American Dream. They never imagined that their children would have such a triumphant position in regards to their education. As 2017 graduating seniors from Cortona Academy in Herndon, Virginia, Kwesi was awarded a $100,000 merit scholarship for college with guaranteed acceptance into medical school, and their daughter, Araba, is in a position to apply directly from high school for nursing college. Araba & Kwesi Dadzie at Graduation. When Kwesi was a junior in public school, he had given up any hope of attending a 4-year college and his sister Araba was a senior and struggling. But Joseph and Georgina had given up too much to come to America, leaving most of their family behind in Ghana, and refused to accept this. They then made the brave decision to try to change Kwesi and Araba’s unsure college futures by investing their college fund on the high school level and transferred both children to Cortona Academy where Araba actually chose to repeat her junior year, rather than to graduate without any hope of her future goals and dreams becoming a reality. 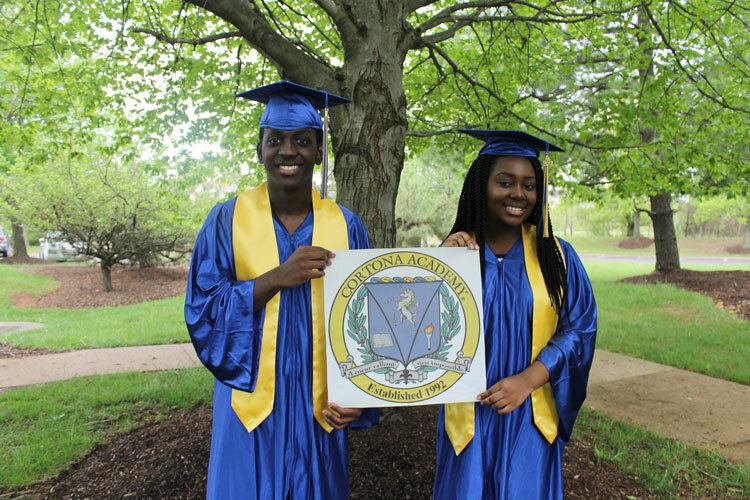 At Cortona Academy, Kwesi and Araba worked very hard and both achieved nearly perfect grade point averages. Especially for Araba, this was a miracle because of her learning disabilities and the fact that she was escaping an on-going bullying situation and hated school, despite the encouragement of Joseph and Georgina. But at Cortona, Araba discovered her new-found self-confidence and joy for attending school, and was chosen as Cortona Academy’s Keynote Speaker for the 2017 Senior Class. Kwesi received the news that he had been accepted to VCU, GW, and Randolph Macon College, and has chosen to attend Randolph-Macon College in Premed, accepted their $100,000 scholarship, and will be automatically accepted into George Washington University’s medical school without having to take the MCATS (Medical School Acceptance Tests) if he keeps his grades up, does internships and community service! Since community service and internships are part of Cortona Academy’s education for all their students, Kwesi is already familiar with the concept that good grades are only half of a person’s success…one must give back. Tomorrow, May 5 is one of the most important days for Joseph and Georgina Dadzie since they came to America. They will watch their now self-assured, motivated children graduate from Cortona Academy at the elegant Waterford at Fair Oaks, where nearly 80 people will be in attendance to cheer the Dadzies and all the other Cortona Academy 2017 graduates, all heading for a real futures, a future that the Dadzie family never dreamed they could achieve, in only 30 years in America. Since 1992 Sharon Strauchs has been leading a team of amazing teachers and humanitarians.